In the past when I had more time, I’d be happy to go out walking even if the forecast was for very low cloud and rain and general gloom. It’s interesting and quite a challenge. As my work has developed though, to take up more of my time, I’ve started to realise that the walks I go on need to be both work and play and as such I tend now to be a little more selective about the weather conditions on the days we walk. Over the last few days it has been just the case. We’ve wanted to get out again on a fairly regular basis in order to build up our fitness again but looking ahead this week, the forecasts were pretty miserable. 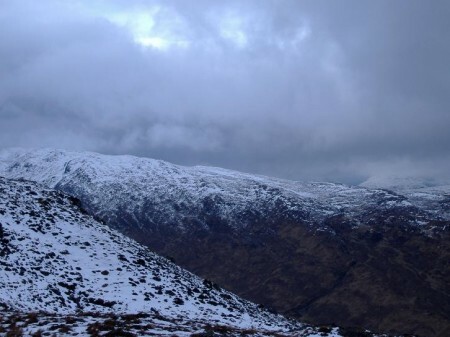 Bands of rain and hill snow coupled with low cloud didn’t look too promising. That said however, Wednesday seemed to offer the best chance of getting a few breaks and slightly higher cloud …although it did appear that we might get quite wet too. We chose to walk Ben Inverveigh, the very modest little hill we’ve visited several times before. 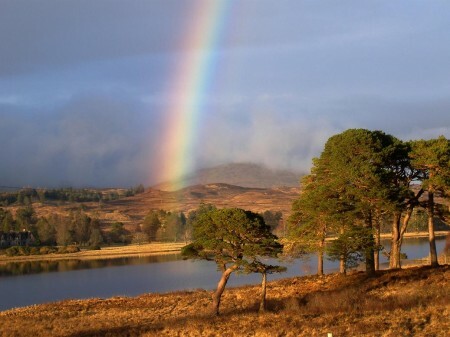 It lies close to Loch Tulla and makes for a gentle walk in an excellent location. As it wasn’t going to be a great hike we didn’t set off too early and stopped for a quick late breakfast at the ‘Green Welly in Tyndrum. The forecast seemed about right and the cloud was very firmly settled at around 650m but with quite a number of breaks offering occasional brightness and even a brief glimpse of blue sky. The snow was a little lower than I’d expected and seemed to start at around 500m. It’s just a short drive from Tyndrum over to our starting point at the Bridge of Orchy and as we approached it we got the first view of our hill …definitely snow topped and with its upper slopes in mist ….but it was dry and so things were looking good. The big hills of Beinn Dorain and Beinn an Dothaidh were well shrouded in mist but the corrie that lies between them looked great..the steep crags on each side of it appearing out of the whiteness of snow and mist. Our route followed the West Highland Way from Bridge of Orchy gently uphill through some forestry before emerging onto open hillside …the northeast end of Ben Inverveigh. 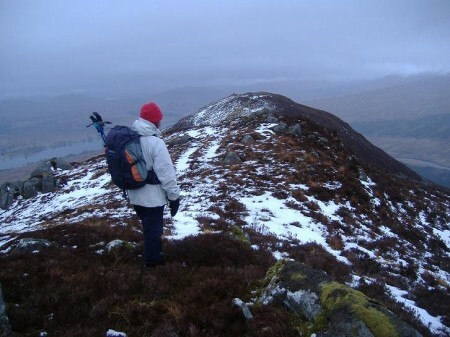 The WHW climbs over this shoulder before descending down to the wee road near the Inveroran Hotel. Our route though left the WHW at its highest point and followed a green track across rough ground before petering out not far below a prominent little top at just over 500m. We’d just got into the patchy snow and in the gloomy light it made everything come alive. Ben Inverveigh is just a long broad grass, heather and stone covered ridge or lump but it is superbly located with bigger hills all around and the beautiful Loch Tulla below. As we went along this ridge we were surprised at the snow ..it was a good covering of 10 – 15 cm with occasional drifts and banked out hollows. 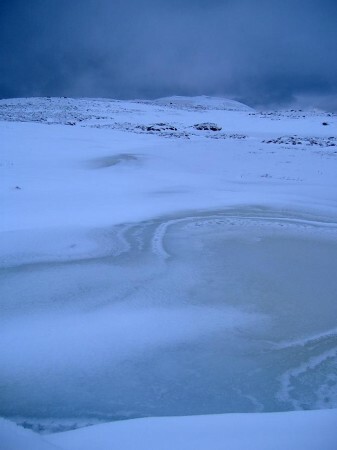 There are a number of small lochans along the way and these were coated in a thin layer of ice which was then covered in snow …care was needed, especially when the cloud came down, not to inadvertently walk over …and no doubt into one of these icy little baths. The summit is at the far end of the ridge …about an hours walk, and is marked by a small cairn perched atop one of the numerous rocky outcrops. We were lucky and arrived in clear conditions and had good views around us ….it was even dry and with very light winds it made for a pleasant if short lunch spot. We retraced out steps back along the ridge and down to the WHW and then followed the track down to the Inveroran Hotel before walking the single track road back to the Bridge of Orvhy. As we descended though, the cloud started to lift and break all around and we got wonderful views of Loch Tulla and the remnants of the Caledonian Forest all shown to their advantage in the bright late afternoon sunlight. But the best was saved till last. As we followed the road back to our starting point, Beinn an Dothaidh and Beinn Dorain became clear of mist and were illuminated by the last rays of the fast sinking sun ….quite stunning and the best view of these hills I’ve ever had. We got back to the car just after the sun had set and after changing out of the walking gear, decided to check out the Bridge of Orchy Hotel. Perfect timing …they started serving food at six o’clock. With a warm fire, friendly service and great food it made for the perfect end to our day. We had a fine day the previous Saturday at the preview to the exhibition at The Strathearn Gallery. The show, comprising paintings by myself and a wonderful selection of glassware and sculpture by Scott Irvine, looks great …even though I say it myself! I was very pleased with the way it had all gone together and Fiona, the gallery owner, had done a fantastic job at hanging and presenting all the work. We had a pretty good turn out despite forecasts for snow. So, if you haven’t had a chance t get along to see it …well, I think you’ll find it a worth while trip.